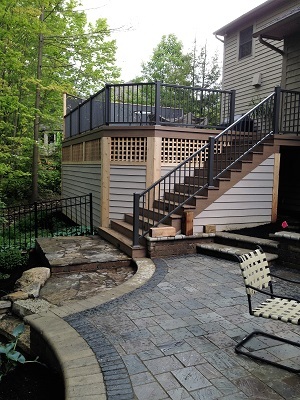 Could your new deck and patio combination be a work of art? When does an outdoor living project cross over into the realm of art? Come along with us, Archadeck of Columbus, as we reveal the answer in the photos of this elegant Westerville, OH, deck and patio combination. With the exquisite details of this project, from the gentle curves and fleur-de-lis angle of the patio to the mesmerizing stone choices, the deck’s striking color palette and homeowner-commissioned privacy screen — this is art. The dramatic curve of the patio seems to embrace the surrounding landscape. Come nighttime, the landscape will drop away and all eyes will be on the flames dancing in the wood-burning fire pit at the patio’s center. 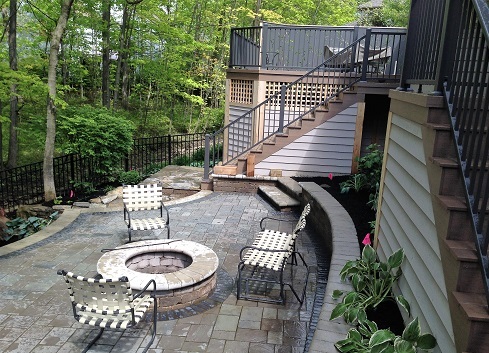 Archadeck of Columbus is proud to have worked with these Westerville homeowners to design and build this splendid deck and patio combination outdoor living environment. 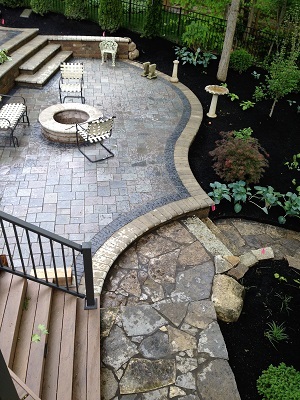 We built the unique patio using a rich variety of Unilock hardscapes. The field of the patio features Unilock Richcliff pavers in a mix of neutral colors from dawn mist to pebble taupe. For contrast, the darker pavers that define the inner border of the patio are Unilock Copthorne, and the color chosen for the inner boarder is Basalt. Then, for additional contrast, we used lighter pavers for the patio’s outer border; these are Unilock Brussels bullnose in the sandstone color. One great quality of the bullnose pavers is their smooth, rounded exposed edge. These smooth-edged pavers also make up the top ledge of the seating wall because of the comfort they provide for seating. The seating wall itself was built using Unilock Brussels Dimensional Stone in the sierra color. Finally, we built the wood-burning fire pit with Unilock Brussels Dimensional Stone, too, in the lighter color. If you look closely, you’ll see an entirely different stone stepping down to the back gate and also on the landing at the base of the steps leading up to the deck. These natural stone slab steps are made of Olentangy flagstone, native to the Olentangy River that runs through Columbus. The flagstone was used here because the area was hilly and the homeowners needed steps for access to reach the back gate. Now let’s move up to the deck. Like the patio, the deck is a pleasing contrast of hues with dark powder-coated aluminum railings and balusters, brown decking boards, cedar posts and lighter-colored heavy-duty cedar lap siding for the underdeck skirting. 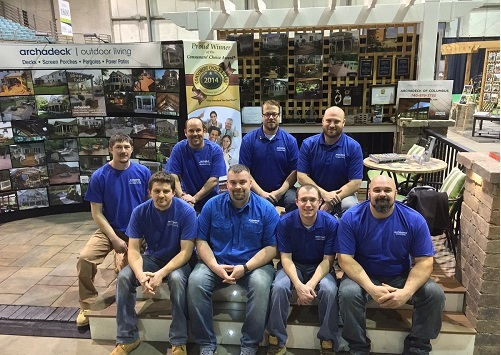 The homeowners selected synthetic decking in the pecan color from the Legacy Collection by TimberTech. These durable boards (a composite core surrounded on all sides by a protective polymer shell) were chosen for their low-maintenance qualities as well as the way they emulate the texture of natural wood grain. We used the TimberTech decking for the surface of the deck, the deck stairs and a walkway leading from the deck to the driveway, which is around the corner of the home. You will notice an almost delicate strip of lattice work covering part of the underdeck area between the siding and the deck itself. There is a very practical storage area under the deck, and we wanted to promote air flow here (in a decorative way), rather than enclose it tightly. Another layer of outdoor living artistry awaits you on the deck. 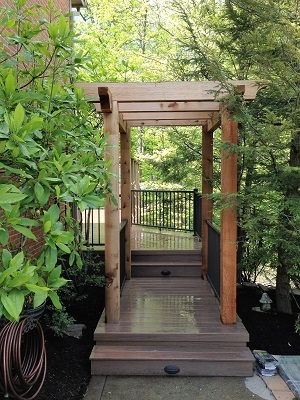 The elegant privacy panels were custom-commissioned by the homeowners and installed by Archadeck of Columbus. You must take a closer look! You can glimpse a backdrop of trees behind the screen, peeking through the swirling design, art and nature intertwined. 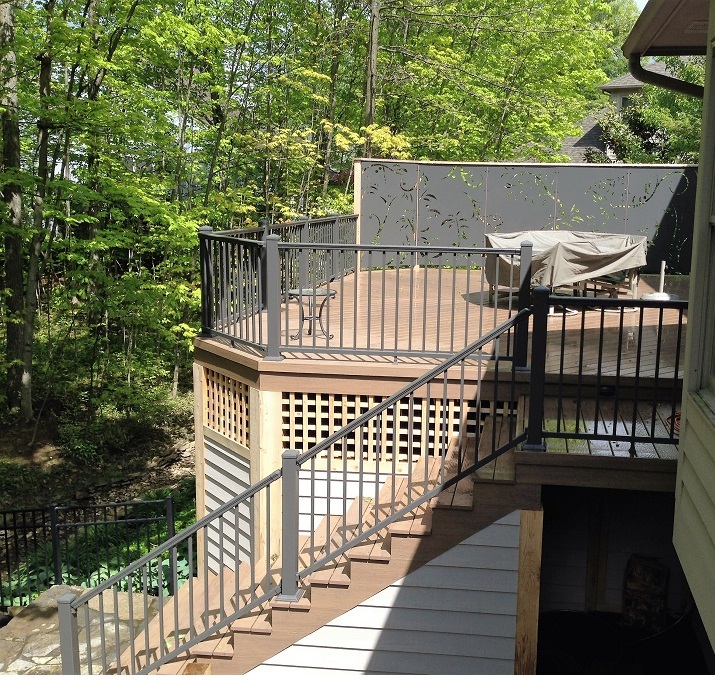 Like the deck’s railings, the privacy panels are made of powder-coated aluminum and will not rust. This deck and patio design holds mystery at every turn, and one more surprise awaits you. Covering the walkway from the deck to the driveway is a cedar pergola that we carefully nestled into the landscape along the side of the house. Tree branches gently nudge the pergola, and the effect mimics the feeling that you are entering the gateway to a secret garden. Is it an outdoor living environment, or is it art? Why can’t it be both? 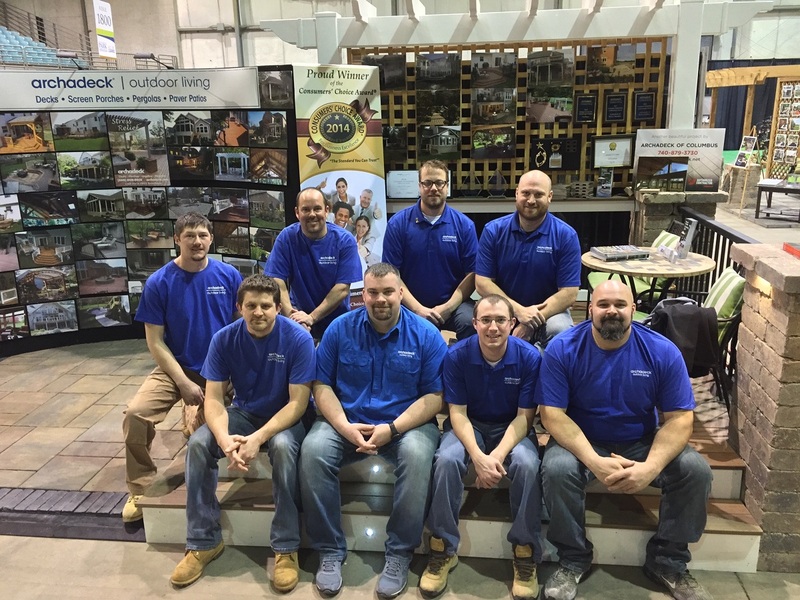 If you are ready to discover what artistry Archadeck of Columbus can design for your outdoor living space, contact us today to learn more at (740) 879-3730 or email us at [email protected].